Steffanie A. Strathdee obtained her BSc, MSc, and PhD from the University of Toronto. A dual citizen of Canada and the United States, she is an infectious disease epidemiologist, and Associate Dean of Global Health Sciences and Professor and Harold Simon Chair at the University of California, San Diego, School of Medicine. 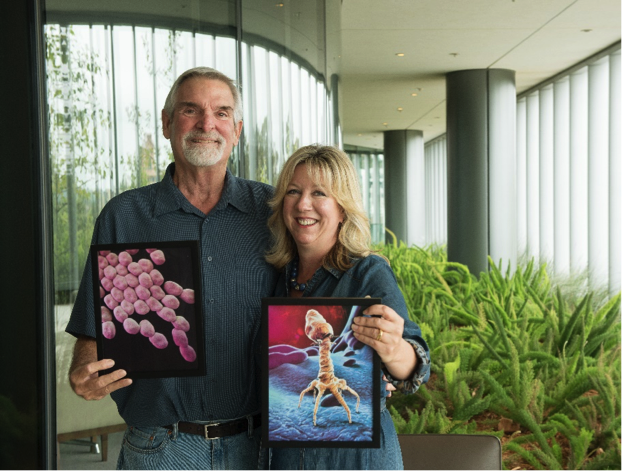 She also directs the new UC San Diego center for Innovative Phage Application and Therapeutics (IPATH) and is an Adjunct Professor at Johns Hopkins and Simon Fraser Universities. Thomas L. Patterson obtained his AB from San Diego State University, his MSc from the University of Georgia, and his PhD from UC Riverside. He is an evolutionary sociobiologist and an experimental psychologist. A Professor of Psychiatry at UC San Diego, he has renowned expertise on behavioral interventions among HIV-positive persons and those at high risk of acquiring HIV and sexually transmitted infections. Dr. Patterson and Dr. Strathdee have worked as husband-and-wife AIDS researchers on the Mexico-US border for over a decade. Their work inspired Jon Cohen’s book Tomorrow Is a Long Time. This is their first book together. A career journalist and book collaborator, Teresa Barker has co-written more than dozen published titles in the fields of health, parenting and child development, education, spirituality, and creativity and aging, including the New York Times bestseller Raising Cain: Protecting the Emotional Life of Boys with Michael Thompson, PhD; The Spiritual Child: The New Science of Parenting for Health and Lifelong Thriving with Lisa Miller, PhD; SELF-REG: How to Help Your Child (and You) Break the Stress Cycle and Successfully Engage with Life with Stuart Shanker, PhD; The Soul of Money: Transforming Your Relationship with Money and Life with Lynne Twist, and The Big Disconnect: Protecting Childhood and Family Relationships in the Digital Age with Catherine Steiner-Adair, EdD, which was named by the Wall Street Journal to the Top Ten Nonfiction Books of 2013. Barker earned her master’s degree with distinction in Literary Nonfiction from the University of Oregon, and her undergraduate degree in news journalism from the University of Tennessee.